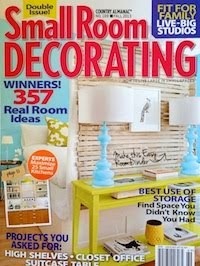 The January issue of House Beautiful features a special section on affordable couches. While I'm not quibbling with their definition of inexpensive (couches are, after all, both the largest and most important piece of furniture you're likely to buy other than a bed), their price range is still a bit high for the young professional furnishing their first apartment or anyone who wants to really pinch pennies. Fear not: you CAN have stylish furniture for less, and Sanity Fair has scoured the web for cheaper choices from quality companies. So here's the couch list: all $999 or under. And there's no IKEA in sight! 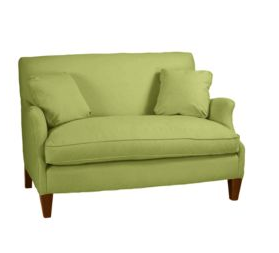 West Elm, Clark Sofa, $999. It converts to a bed for guests. Two pieces for one price? Ingenious! In light camel or pumice. 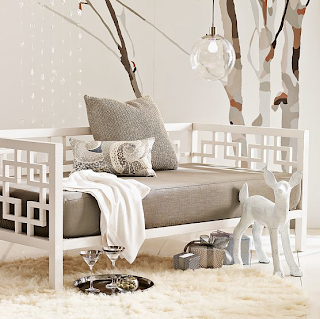 Z Gallerie, Pauline Sofa, $999. Matching chair and chaise available. I'm loving the silver nailhead detail. Z Gallerie, Dean Sofa, $999. Matching chair/sectional piece available. Designer Nate Berkus for the Home Shopping Network, $499. Comes in 9 other fun colors! KMP Furniture, Lowboy Sofa, $975. With a matching love seat and coffee table available. PB Teen Cushy Love Seat + Base, $799 - $1,200, depending on selections. 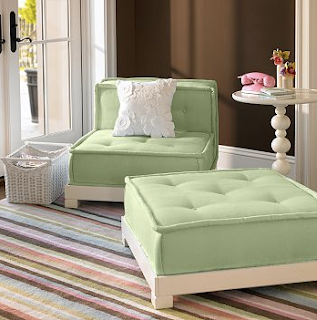 Comes in 6 colors, with matching side chairs and ottoman. A great transition piece for grad pads or studio apartments. Buy the bases with storage cubbies for extra stowage. 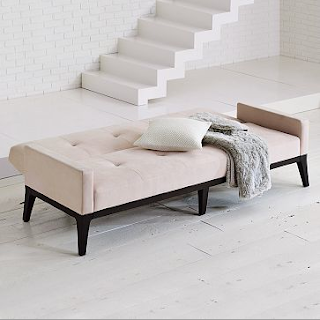 West Elm, Overlapping Squares Daybed, $959 (mattress, bolsters (not seen here), and cover included. Frame only available for $459). Out of town guests? No problem! You can have space AND style. 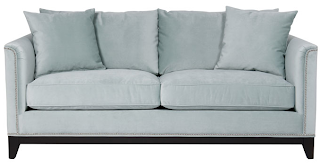 Macy's, Chloe Velvet Metro Sofa, $699. Classic lines, available in 6 colors. Matching chairs, love seat, and ottomans available. 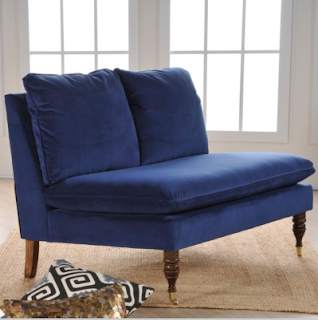 Ballard Designs, Hudson Settee, $799 - $1,183.00. Perfect for a small space, or buy a matched set. Choices in more than 50 fabrics! Overstock.com, Cream Black Oval Settee, $329. 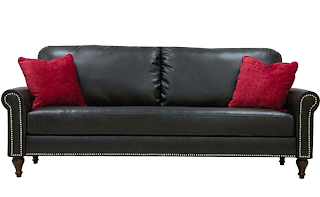 Overstock.com, James Black Renu Leather Sofa, $599. CB2, Parlour Sofa, $999. Love the color! All images, companies as attributed. Some stylish solutions, even on a tight budget. Lovely job, Skyla! Glory, glory hallelujah. Just thinking of IKEA gives me hives. Big congrats on the Atlanta Magazine mention!! How exciting! I will tell my daughter about these. We are going to Atlanta this weekend for the tour of homes and are making a trip to Ikea to pick up two chairs she wants. I am absolutely dreading it! 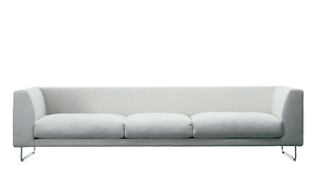 Super cool affordable sofas! I love the pb teen one in pink - but I'm sure I'd never actually buy it. I'm going to click through to see their other color choices though! Truly great options, Skyla! I have the overlapping squares daybed and it's transitioned well from my old place to my new place. It's nice to be able to switch out the slipcover/bolster covers. And I have that yellow CB2 sofa. Glad to see a major retailer is getting into the MCM game. I read that article in HB and thought exactly the same thing - these are lovely but there must be something under $1000 that is worth considering. Great choices and some new sources I hadn't considered before. Thanks. i really like that last yellow couch. simple and in a great color. Thanks everyone - this was a really fun treasure hunt! I'm tempted to try it for other pieces of furniture. And Claire, thank you! It was such a nice surprise to see Sanity Fair in the magazine! 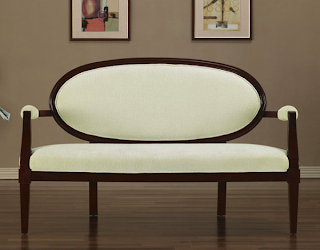 I totally missed the nailhead trim on the Z Gallerie Pauline. Also never noticed the Clark at West Elm before either.